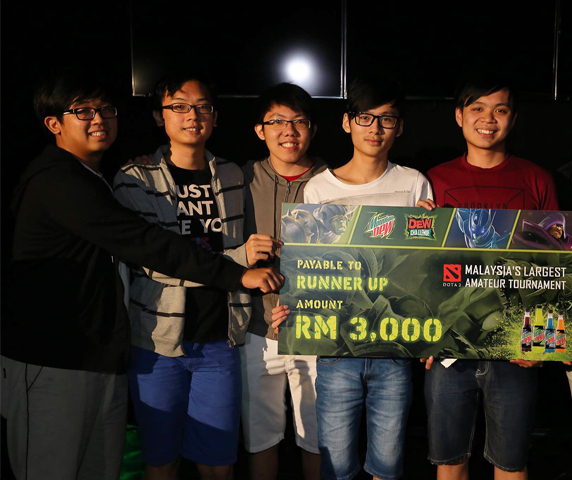 Following their success in the two-stage college/university level earlier in November 2015, UTAR’s iFAT team managed to place in the top eight among the 28 teams in the Mountain Dew Dota 2 national level tournament held at the TGV Cinema, One Utama in Selangor from 5 to 6 December 2015. This round the team walked away with a cash prize worth RM3,000 and a certificate of participation each. The team comprised Entrepreneurship student Yong Say Fong, Computer Engineering student Chai Mun Hong, Accounting student Ang Boon Liang, Environmental Engineering student Tay Kok Sheng, and Foundation in Arts student Wong Meng Kit. “Though we could not go very far in the finale, we are immensely proud of our achievement to be in the top eight. It was a good opportunity for all of us to improve our skills,” enthused Yong. “It was an enjoyable and fun moment for all of us. We didn’t expect that we could manage to reach the finals as we found that there were a lot more skilful players who took part in the competition. Even though we lost in the qualifier round yet we felt proud to be in the top eight among the top 28 teams,” said another participant, Chai. Mountain Dew’s Dew Challenge 2015 is a digital gaming challenge. The Challenge comprises two games, namely Dota2 for teams of five and Hearthstone for individuals. The RM180,000 pool of prizes given away was the combination of RM150,000 cash prizes for Mountain Dew Dota2 Challenge and RM30,000 cash prizes for Mountain Dew Hearthstones Challenge.